Whether you want start your day in overdrive with a brain crusher or just bored, a good puzzle game can get the logic going for your thoughts. The reason you can't just walk away from these little apps is the simple gratification you get from solving the problem.A good puzzle or word game can be so addictive that it might get you kicked off a plane, end your relationships and even invade your dreams. One great new app that has just come out is one such puzzle game, and we will be talking about it on this article. 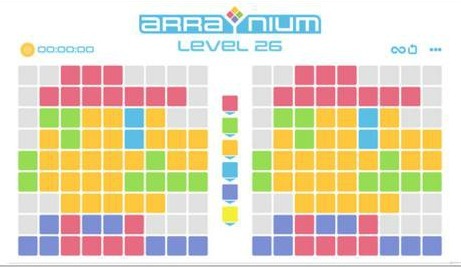 Arraynium is a brand new puzzle game available for both Android and iPhone users for free. The game has a very simple, yet highly effective game concept capable of bringing you tons of fun and engagement for your time. In the game, you have to match the color of the blocks from the left side to be identical as the right side. You do this by pressing on a block. The block you press changes color 2 times, while all other blocks that touch it change color once. The game concept is very simple and cool. There are tons of levels, epic music and a smooth interface design. We recommend it to every puzzle lover out there. You can find the app on the App Store and Google Play.